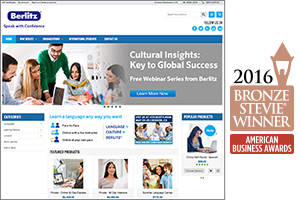 Integrated Marketing Services (IMS) helped Berlitz, the language and cultural training leader, to increase sales and build its brand, redesigning its eStore to be easier to locate products and more convenient to check out. We also created the parrot video to engage users and build brand awareness. More than 3,400 nominations were reviewed by more than 250 business professionals in the nation’s premier business awards program. 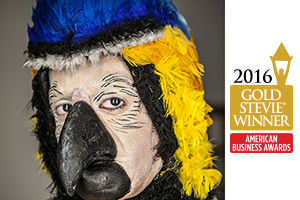 IMS won the prestigious Gold Stevie®, the third recent Stevie for IMS, for a Parrot video for Berlitz. The parrot video demonstrates the value of learning at Berlitz in a fun and engaging way, building brand awareness for Berlitz. IMS also won a Bronze Stevie award for the Berlitz eStore. The goals of the redesign were to make the site more modern, enhance user experience and increase sales. In just one month after launch, sales were higher than the entire year before on the old eStore.